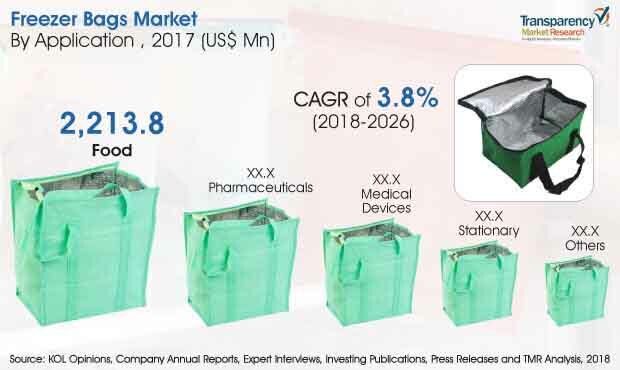 According to the latest market report published by Transparency Market Research, titled “Freezer Bags Market: Global Industry Analysis, Size, Share, Growth, Trends and Forecast, 2018-2026,” HDPE (High-density polyethylene) freezer bags segment is expected to be the largest contributor to the global freezer bags market over the forecast period, 2018-2026. The revenue generated from global sales of freezer bags has been estimated to be around US$ 3,789.5 Mn in 2018, and is projected to increase at a CAGR of 3.8% during the forecast period 2018-2026. Burgeoning urban population and changing consumer lifestyle has propelled the market for freezer bags. Moreover, growing demand for freezer bags has also been recognised by various freezer bag manufacturing firms across the globe. Manufacturers of freezer bags are focusing on expanding their production capacity either by adding machinery to the manufacturing facility or by acquiring the emerging small and regional freezer bags companies. The trend among freezer bags manufacturing firms to expand their production capacity to meet the increasing demand of freezer bags has fuelled the freezer bags market. In addition to that, the growth in retail stores around the world is expected to further propel the market growth. Moreover, attractive and functional packaging of freezer bags, especially for food sector has also driven the market in addition to the superior barrier traits such freezer bags exhibit. However, due to rapid expansion in the production capacity of freezer bags around the globe, the problem of over capacity is also rising. Moreover, increasingly strict regulations against plastic use have also been hindering the market growth to a great extent. However, poor penetration of freezer bags in emerging economies of Asia Pacifica and Middle East & Africa region has slowed down the growth of the global freezer bags market. Although, the key global players of freezer bags market have made the market highly competitive for the smaller and emerging players to sustain in the market, the private label brands of freezer bags are also experiencing considerable growth. Progressing market for nationwide retail chains has created ample opportunities for the freezer bags market players. In terms of opportunity created by the geographical regions, North America’s freezer bags market is expected to create a slew of opportunities during the forecast period, owing to escalating demand for freezer bags from the food sector in this region. The market volume for global freezer bags is expected to expand 1.4X over the forecast period 2018-2026. Some of the major players operating in the global freezer bags market include S. C. Johnson & Son, Inc., International Plastics, Inc., Reynolds Consumer Products LLC, Weston Brands LLC, Star Poly Bag, Inc., The Glad Products Company, Rutan Poly Industries, Inc., Inteplast Group, US Poly Pack, Elevate Packaging, Inc., Uline, Inc., Abbey Polythene Ltd., Universal Plastic Bag Manufacturing Co., Falcon Pack Industry LLC, Maxpak Australasia Pty. Ltd., Polybags Limited, WeiFang ChangLe Shuguang Industry Co., Ltd., Xiamen Huli Fengyi Industry Co.,Ltd., Great American Packaging, Inc. and Convex Innovative Packaging. The report analyses the global freezer bags market in terms of value (US$ Mn) and volume (Mn Units). The global market for freezer bags is segmented by material type, application and by region.